Type the phrase “到此一遊/游” (daoci yi you) into an online Chinese dictionary and chances are the results will say it’s a type of vandalism meaning “…was here”, as in “so-and-so was here”. This phrase is often used as a form of graffiti by Chinese tourists wanting to record their visit to a particular site. The most famous modern example that comes to mind happened in 2013 when a Chinese teenager defaced a carving in Egypt’s 3,500-year-old Luxor Temple with the phrase “Ding Jinhao was here” (丁锦昊到此一游, Ding Jinhao daoci yi you) (fig. 1) (Wong, 2013). Fig. 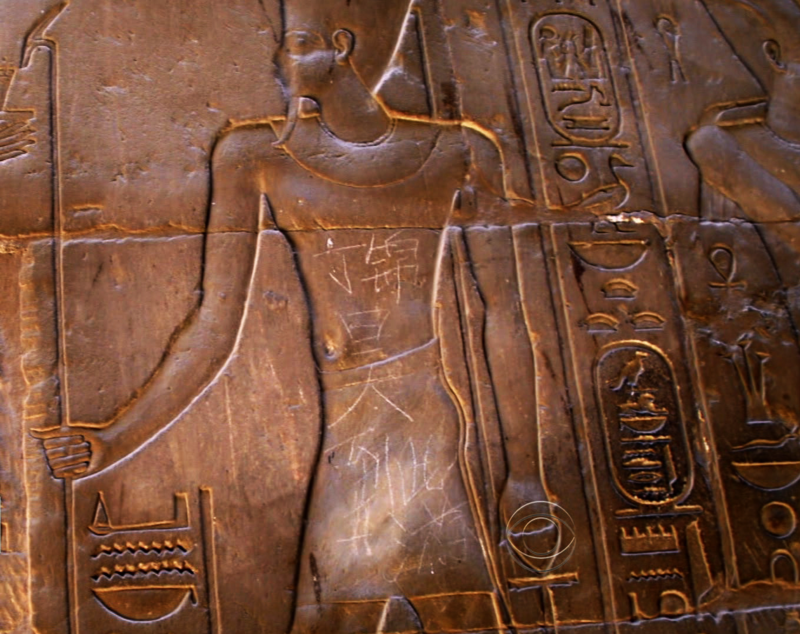 1 – The “Ding Jinhao was here” graffiti on the face of a Luxor Temple relief (larger version). Screenshot from a CBS news report. As the Great Sage advanced, he suddenly saw five flesh-pink pillars supporting a mass of green air. “This must be the end of the road,” he said. “When I go back presently, Tathagata [the Buddha] will be my witness and I shall certainly take up residence in the Palace of Divine Mists.” But he thought to himself, “Wait a moment! I’d better leave some kind of memento if I’m going to negotiate with Tathagata.” He plucked a hair and blew a mouthful of magic breath onto it, crying, “Change!” It changed into a writing brush with extra thick hair soaked in heavy ink. One the middle pillar he then wrote in large letters the following line: “The Great Sage, Equal to Heaven, has made a tour of this place” [齊天大聖，到此一遊, Qitian Dasheng, daoci yi you] (Wu & Yu, 2012, pp. 194-195) (fig. 2). Everyone who has read the story knows the pillars are in fact the Buddha’s fingers and that Monkey never left because the former had exercised his great spiritual powers. Sun is shortly thereafter crushed under Five Elements Mountain as punishment. Fig. 2 – Sun tags the pillar (Buddha’s finger) with the phrase “The Great Sage Equaling Heaven was here” (larger version). From Son Goku (1939). The quoted translation by Anthony C. Yu can be rendered simply as “The Great Sage was here”. This is a perfect example of Monkey’s brash, ego-driven personality, not unlike the type of tourist who’d think it appropriate to defile an ancient monument with their name. A few online sources (example) suggest Journey to the West is the origin of the “…was here” phrase used by so many Chinese tourists. However, knowing that the novel has so many historical influences, I’m of the opinion this literary element certainly has a real world origin. But the novel no doubt helped make the phrase more popular in the public eye. Can you imagine how many people copied this episode shortly after the novel was published during the Ming Dynasty?